Hannah has been a regular attendee at Open Kitchen. She is a student studying Occupational Therapy and is interested in using her skills to enrich the lives of asylum seekers who are forced not to take up, continue or practice an occupation of any kind through the rule that they are not allowed to work. This is an interesting area. Someone who has not worked with asylum seekers might wonder what the point would be of practicing Occupational Therapy with people who are not “occupied” in terms of employment and who are legally obliged not to work by the system that they are in. My opinion after working with asylum seekers for 16 years is that they are the ideal group to practise this area with, as unlike other peer groups there are no asylum seekers who are immune to the stresses and strains of the daily routines in which they find themselves. Just as Occupational Therapy can be applied to assist retired people who have finished their working lives, the tools and techniques involved could be employed to assist those that are forced into premature abstinence from occupation for an indefinite period of time. Today, Hannah came along to Open Kitchen to take part in the “Challenge Hannah” challenge. Hannah opted to do stuffed peppers and there was some discussion in the facebook group as to whether this was in fact Dolma/Dolmeh, in different cultural clothes… It seems to have been agreed that they were in fact different dishes, but none the less brilliant and relished by all in attendance. Hannah used barley and couscous in her stuffing, as well as lots of vegetables. 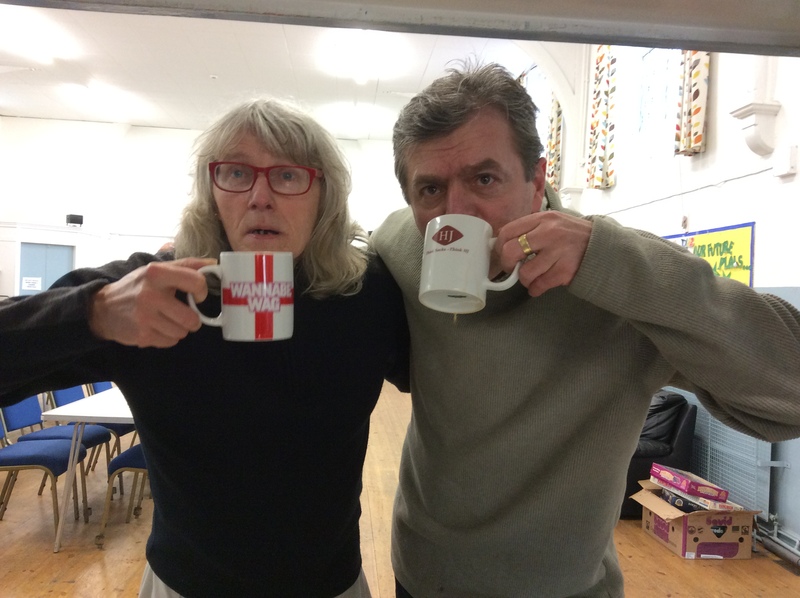 Like the “Jenny Challenge”, we were lacking an essential implement, a grater this time, which led to improvisation induced fun, thanks to John 🙂 John also found time to express himself over a coffee and was even seen on top of the piano at one point, but we’ll keep that one under wraps. I must also note that Jenny excelled herself once again, using up the remainder of the mincemeat from her challenge in a fruit crumble that also entailed apples, bananas, oats and chocolate covered peanuts – it was well enjoyed Jenny! 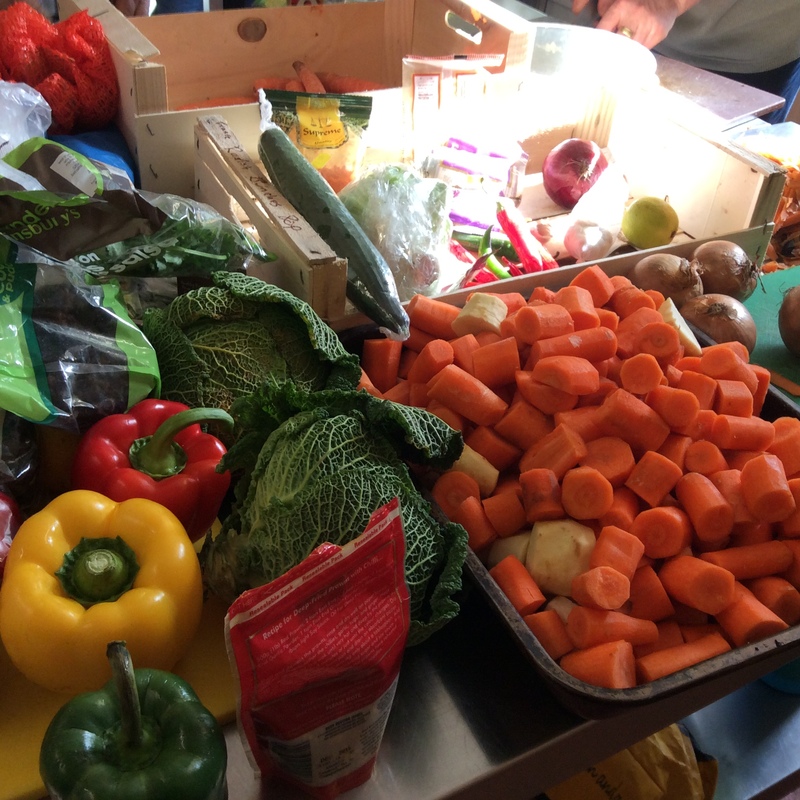 We received excellent donations from Seven Hills Bakery on Sharrow Vale Road again this week – whole crates of bananas and carrots and numerous other things that made cooking together even more fun – we really appreciate the fact that they are supporting Open Kitchen. Open Kitchen’s purpose is to support destitute asylum seekers, those in the asylum system and those who have recently received refugee status who are struggling with the change in their circumstances. We also aim to support anyone in the neighbourhood where we operate who is struggling with food poverty and we appreciate that this is not something that discriminates over nationality! We have found increasingly that “born and bred” British people are including themselves in the group and this presents us with a unique opportunity to contribute to cohesion in the local community. The great thing that happens at Open Kitchen is that the traditional “visitor” and “host” roles are often reversed or go out of the window all together. While we strive to create a family atmosphere and are loathe to commersialise events by charging fees for the food and time that we offer people, we could not keep going without the generous donations that some people and businesses elect to offer us and would like to give a special thank you to all of those who have given food, money and time to keep us going. This looks great. Nice one Hannah! Probably one of the most underrated and yet most important issues in the UK at the moment. I think more people should spread light on the terrible conditions and expectations many Asylum Seekers are faced with currently in the UK!